I’m going back and rereading my favorite books of poetry these days, or at least I think I’m going to. 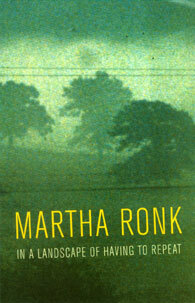 So far, I’m rereading Martha Ronk’s In a Landscape of Having to Repeat. And then what will be next. In a landscape of having to repeat. Noticing that she does, that he does and so on. The underlying cause is as absent as rain. Yet one remembers rain even in its absence and an attendant quiet. If illusion descends or the very word you’ve been looking for. green and gray squares, undefined. I’d like to get to the bottom of that one. than ever and she did and now he can hardly remember what it was like. Backing off is the only way. But I like it too much one of them said. The approximate time is 11:42 and your time is up. The relative motion of two objects moved. Proximity is neither like nor not like. A camellia in a glass bowl like the one yesterday. Who’s to say this is like that or I like it or taking it in. I write to you as an approximation of intimacy. Doesn’t one want to move out over the edge. You taste like grass, he said. A quarter of an hour becomes an arc, a repeated habit, the fixity of fixed ideas. How odd to have had the thought, I’m going to have a splendid time. Not that there is anything wrong with it, and not that they are not "accomplished," but the poems quoted here ARE good examples, are they not, of a by-now quite conventional, institutionally absorbed "hybrid" mode? The Georgian verse of our time? I've seen these poems dozens and dozens of times over the past five years in _Denver Quarterly_, _Conjunctions_ and _Fence_, to name a few. Every son and daughter of Brock-Broido, Bang, Streckfus, Wright, and Gizzi, to name a few, comes out of Columbia or Amherst or Brown or Wash. U or Alabama with the same garbled syntax and fractured scenes and overlapping points of view. This mode has become the most tired. Whatever happened to mastering form before unfolding it, perfecting syntax before tickling it out of shape or cleaving it, understanding unity before fracturing it? Kent and "Anonymous" are right (note: I'm Anonymous's twin brother, Anonymous). All you need to write poems like these are: an education at an Ivy League school such as Yale and an interest in poetry. The Ivy League education allows you a certain intellectual vocabulary. The interest in poetry makes you write poetry rather than, say, cultural criticism, or fiction, etc. What's lacking from these poems is risk, danger, emotion: one can read them and feel no fundamental change. They pass over you like commercials. They're rip-offs of Stevens without Stevens's skill or originality. I agree with Kent that they are "accomplished," but are they necessary? Do we feel, after reading them, that we're missing the tops of our heads? I still have mine and I, for one, go to poetry to have it blown off. We have not yet issued an opinion concerning Martha Ronk. Please stand by. "This mode has become the most tired." "I agree with Kent that they are 'accomplished,' but are they necessary?" We all have our own lists of modes that are tired. For me, Ronk's mode (yes, it's a mode others also write in) is not one of them. It might be for you . . . but to imply that there is a "that was SO last year" about it is to fold into a fashionista argument. I'm tired of fashion. I want something I can believe in. I'm tired of "make it new" and the whole "top of one's head coming off" thing. I'm interested in the way Ronk works what feels like direct conversation, but outside of any formal concern for communication. I'm continually charmed and puzzled by it, and I love reading it over and over. On a Thanksgiving of having to reheat. The underlying cause is, "Please pass the Ashberry sauce." Yet one remembers pie even in its absence and an attendant hunger. If hunger descends or the very thing you've been looking for. festive and with placemats, undefiled. I'd like to eat to the bottom of that one. remember what she tasted like. Don't forget the parade and football! For me Ronk's poems are both maddening and engaging: part of me is put-off by the world-weariness/Joan Didionesque/ultra-knowing (within unknowing)tone, and other parts are intrigued by just those elements; if a microscope could daydream/develop a lazy eye (not sure what a lazy eye is but am pretty sure it's a colloquialism, and at the moment I like it) I imagine the tracings could look like a Ronk poem. Maybe another way of putting it would be much of her work within the last ten years strikes me as a cross between jaded and jade, its blues and greens, its lustres, plus its lack of dazzle, lack of spark. I tend towards favoring emeralds, but her poems are also consistently insistently informing some threads of my own poems: I've immitated her more than anyone. Whatever happened to The New Sincerity?